People often say that the Greek Island of Santorini offers up some of the best sunsets in the world. And, as someone who can never see enough pretty sunsets, I was looking forward to visiting Santorini for this reason alone. 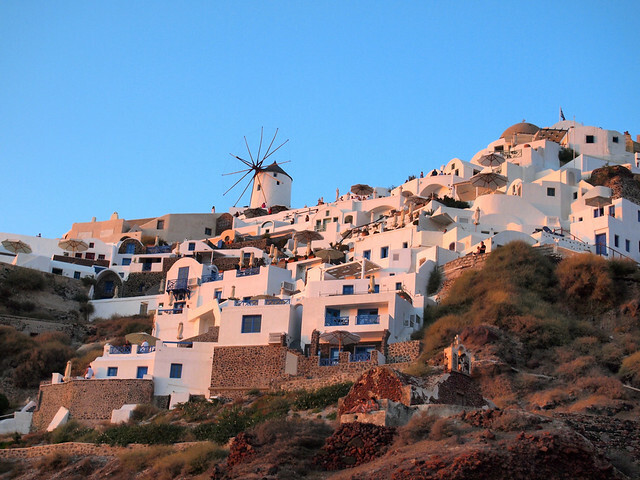 Watching the sun dip into the Aegean is most popular from the cliff-top village of Oia — the one with all those windmills and blue-domed churches that you see on postcards. But I was curious as to whether this really was the best spot to watch the sun set on Santorini, or if it was simply the one everybody knew about and therefore flocked to. 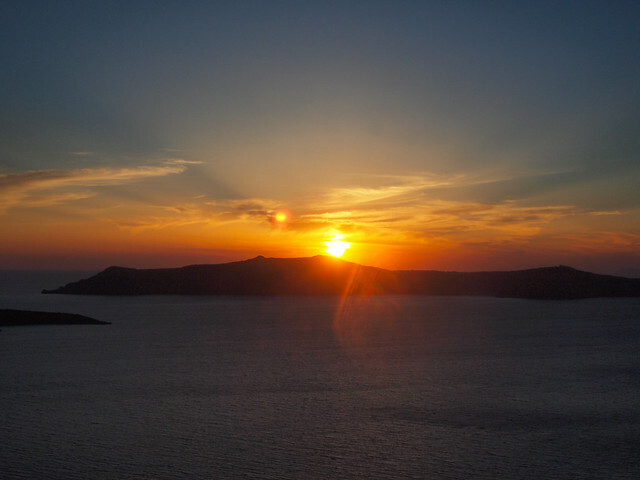 And so I give you: my Santorini Sunset Smackdown, in which I will compare watching the sun set in Oia and Fira. Fira is the largest town on Santorini, and is also the first introduction many travelers get to this Greek island. Santorini's ferry and cruise ports are located in Fira — along with many hotels and restaurants. Fira isn't known for its sunsets, and yet you can still catch some pretty great ones from this end of the island. The village of Oia is located on the northwestern end of Santorini. The village is THE place to go if you're looking to snap photos of traditional Greek buildings — especially those blue-domed churches. Built up on top of Santorini's rust-red cliffs, Oia offers up a perfect vantage point from which to watch the sun set beyond Ammoudi Bay. 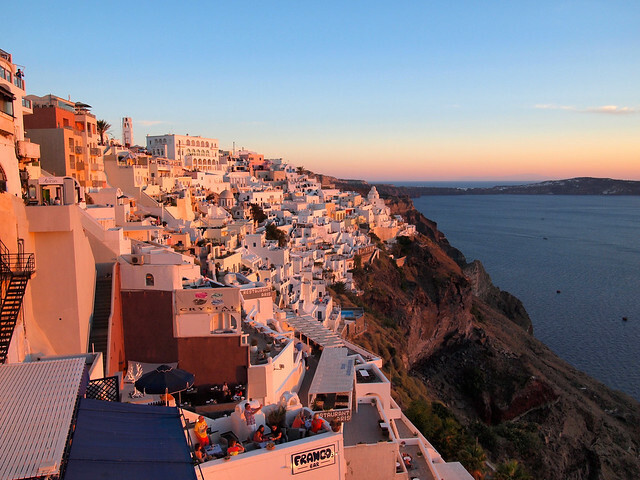 Since many people choose to stay in Fira on Santorini, getting to a sunset spot there is quite easy — you can simply use your feet to get to the best vantage point in town. You'll have to head to the top of the donkey trail (through the narrow and twisty streets) and then simply find a spot along the low wall. If you happen to be staying elsewhere on Santorini, taking a bus is your best bet to get to Fira. 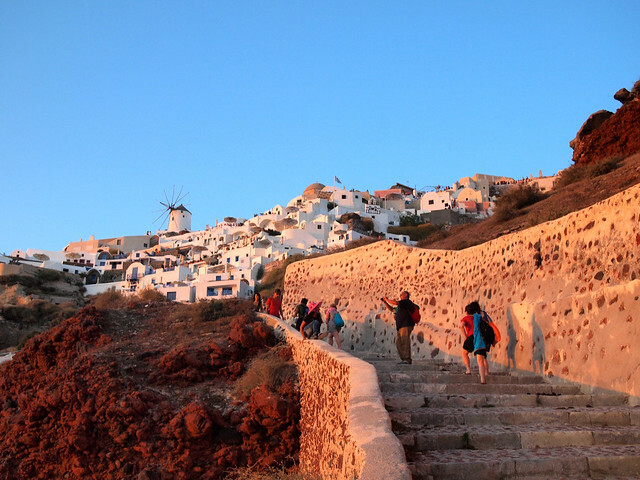 To get to Oia‘s best viewpoints, a bus or rental car is required (and then a bit of walking). The ride/drive will take roughly half an hour from Fira, and you'll have to time it right to make it for sunset. Oia gets quite crowded leading up to the predicted sunset time, and you most likely will have to jockey for position in order to score one of the prime spots. The good news is that as long as you can see the water, you'll still get a fantastic show. I watched the sunset from the Oia donkey trail and thought it was lovely (if perhaps a bit smelly). 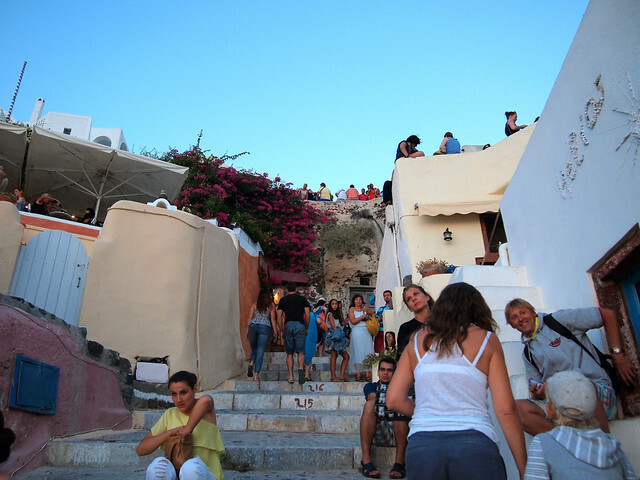 Conversely, the crowds in Fira are only a fraction of the size of those you'll find on the other end of the island. I saw a lovely sunset in Fira and only had to compete with perhaps 2 dozen people for my view. This is surprising considering that you basically have the same view out over the ocean in Fira as in Oia. As hinted at above, you really can't go wrong in Oia. Whether you are on the donkey trail, at a terrace restaurant, or standing up by the windmill, you will get a stunning view. Take note of how the sunset here makes the cliffs (and even the buildings) look like they are on fire. In Fira, you won't spot any windmills or blue-domed churches — but you can still look out over the stair-stepped buildings of the town and the volcanic caldera. I suppose, based on the numbers, that Fira would actually win in the Sunset Smackdown. You still get great sunset views in this town, but without the huge crowds that gather each evening in Oia. But, to be honest, I would still suggest braving those crowds to witness an Oia sunset. Watching a sunset in Oia is such an iconic, bucket-list-type experience that I wouldn't counsel anyone to skip it just because of the crowds. There's a reason that these sunsets are world-famous, after all — they truly are breathtaking. 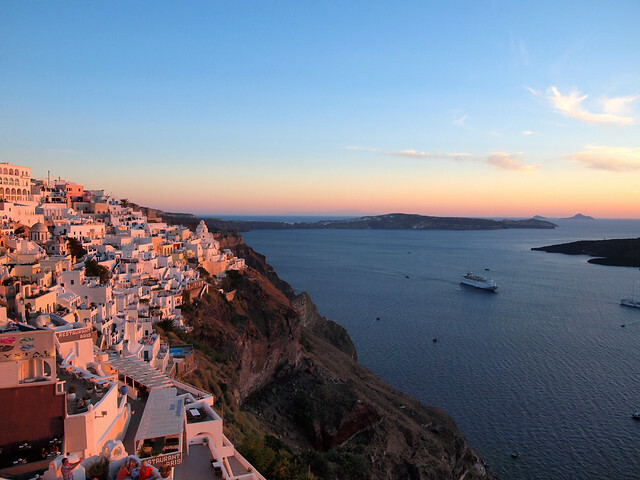 So tell me — where would YOU rather catch a sunset on Santorini? *Note: I visited Santorini as part of a complimentary Greek Islands tour from Intrepid Travel through my partnership with them. All opinions, though, as always are entirely my own. I kind of feel like sunsets on Santorini are probably all amazing, no matter where you are! These photos are ridiculously pretty. Even though you can’t see the actual sunset, photo #8 is pretty because of the pink hues. Well done! Thanks, Patti! Now imagine how much prettier they were in real life! Just keep being patient, Patti! Visiting in the spring will be lovely, I’m sure. I loved watching the Oia sunset. My friends and I rented ATVs in Fira and enjoyed the ride to Oia and the view is absolutely goregous in Oia. It wasn’t too crowded when I visited in May and there were some cute stray dogs watching the sunset with us too. It wasn’t as crowded in Oia in September as it could have been, either (though there were still lots of people). Loved it anyway, though! Definitely love how you captured the sunset! Would have to say I’m more of a sunset person than a sunrise person so i definitely love this entry! Same here, Hannah! I mean, sunsets can be amazing, too. But I can be grumpy if you wake me up too early… haha. Oh my gosh! 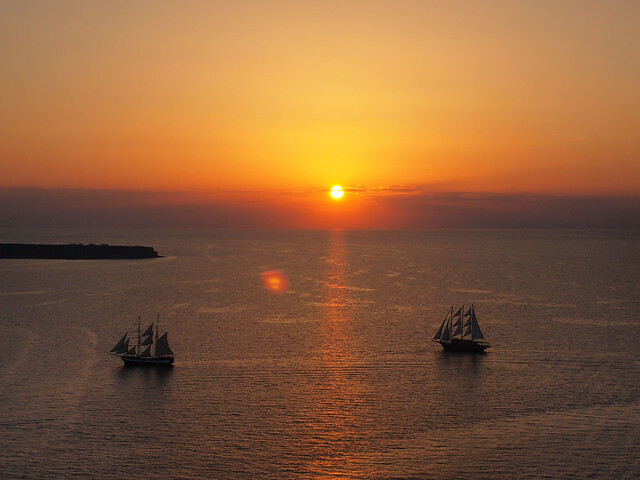 This is gorgeous… Santorini oozes out such mesmeric sunsets! Simply breathtaking! 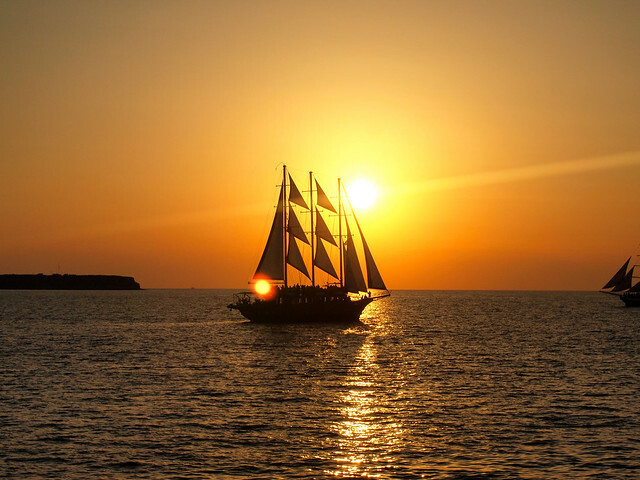 There’s a reason why people tell you that Santorini has some of the best sunsets in the world – I think it does! 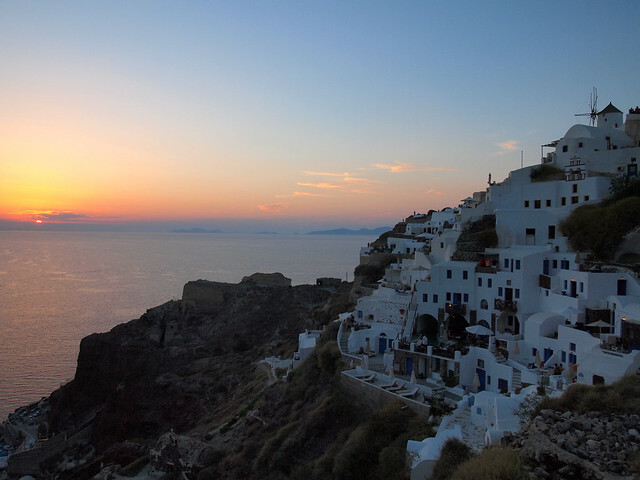 We liked Imerovigli, which is between Oia and Fira best for sunset. No crowds! Gorgeous sunset photos, BTW! Good to know! I’ll keep that one in mind for next time. There really is no bad place to watch the sunset in Santorini! I did enjoy it from Oia once, and you’re right, it’s totally worth getting over there. I took a volcano tour which ended in Oia for the sunset, great day. My hotel was in Fira, and all I had to do was walk across the street and sit on the wall on the other side to watch the sunset from there, which I did the other 3 nights I was in Santorini. Gorgeous! It’s good that you got to see it from both places too, Ali! Great post comparing the two! Sunsets are always one of the things I look most forward to especially if I’m traveling somewhere more exotic. I’d have to go with Oia-as you intimated it’s something you always hear about doing. I really look forward to sunsets, too. I can never get enough! Hahaha, yes. For “scientific” purposes, you’ll definitely have to try them both out! I can imagine that you get some great sunsets in Arizona! I’ve seen a couple out that way myself that were really beautiful. But yes… definitely no sailboats out in the Southwest! The fact that it can be so much cheaper to visit other Greek islands is the main reason I’ve not yet made it to Santorini. But I’m wondering whether I need to stop being such a cheapskate and just go. I need some of that sunset therapy! I would definitely tell you to at least consider it. Santorini really wasn’t all THAT much more expensive than some of the other islands I visited (though it’s worth noting that I went to Greece at the end of the tourist season). And those sunsets are so worth it! Love this post! I can’t get over that first picture. Thanks for sharing. Thanks, Lauren! I love that first photo, too. Definitely going to hang it up on my wall once I have walls of my own again! Man, these pictures are making me miss Greece so much. I would love to check out Oia because those sunsets look amazing! Although my favorite picture is the one you took in Fira, looking over the town. All those pink hues cast on the buildings are beautiful! Your analysis was spot on – I have seen the sunsets at both places and while Fira is more convenient and less crowded, there is nothing like the sunset in Oia. It is definitely worth braving the crowds. Your photos are beautiful – you captured some great colors! Thanks, Birdget! I loved both sunsets, and this post was the best way for me to share both of them! I love your fourth image, Amanda! 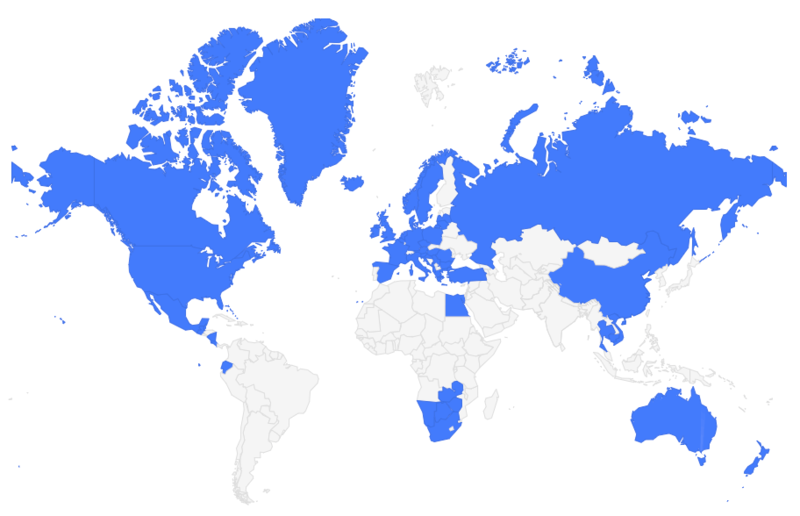 Interesting to the pros and cons about each location for sunset-worshippers too! Thanks, Liv! Glad you liked the post! That first photo of the sailboat needs to be hanging on a wall! Beautiful! I’m planning to do just that once I have an apartment again, Laura! Great pictures! My favorite place is at Santo Wines, in Pyrgos. I’m pretty sure some of the people I was traveling with tried some Santo wine! Just loved ALL your photos! Going to Santorini in September and can’t wait! Can you advise does Fira or Oia have good nightlife and if so which one rocks the most? Santorini in September is fantastic!! I would assume that both Fira and Oia would have nightlife, but you might find more in Fira. Note, though, that September is getting into “low” season, so some places may be closed already! I’m not much of a partier myself, so I can’t say I checked out the club scene on Santorini at all! It’s definitely worth going to both places if you have the time! I’ve spent a bit of time looking at different view points in Oia but I would definitely love to spend time in Fira to get a different perspective of the sun hitting the white buildings. It was definitely nice to see it from both places! Hi my cruise ship departs Santorini (Fira) at 8pm on 9th August. Do you think we will be able to see the sunset from the cruise ship as we depart. Do you think it will be as good a view from sea as it is from land? Yes, you should be able to see it from the ship! You obviously won’t be able to get all the windmills and buildings in a shot with the setting sun, but it still should be a pretty nice view! I agree that you just have to experience both. I actually enjoyed the sunset in Fira a little more. It was redder, rounder and more charming. But Oia’s sunset is undeniably set at Santorini’s most scenic backdrop so it has that as upper hand. I would definitely recommend seeing both! 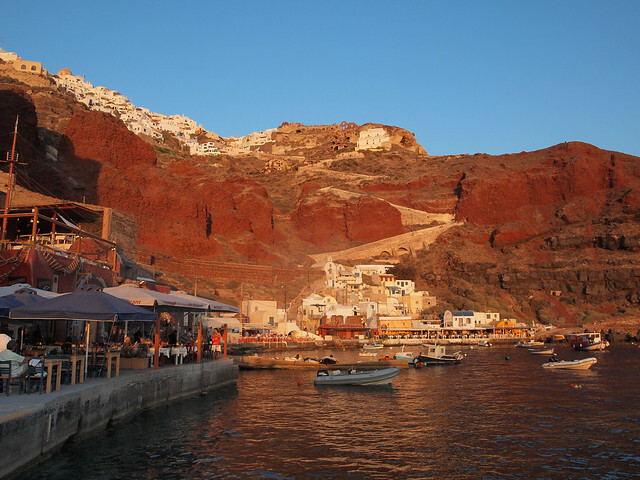 Sunset in Fira is still beautiful – enjoy your cruise!